Last night, we had the incredible pleasure of watching one of the funniest plays put on by 2 classes of kindergarteners, as a tribute to all the wonderful “neighborhood workers” such as the crossing guards, firefighters, plumbers, etc. Brianne and Bridgette have been practicing for the play for nearly a month. In fact, they’ve sang the songs so often at home that I’ve had more than a few moments where the tunes simply would not leave my head. I found myself humming the tunes while I cook, during my shower, and even as I drive! The lyrics to each song had us belly laughing quite a bit. I don’t know how these teachers do it….it’s amazing to witness how much Brianne, Bridgette, and their classmates have grown during this school year, in their maturity, independence, and knowledge-base. Here are a few video clips of the play! 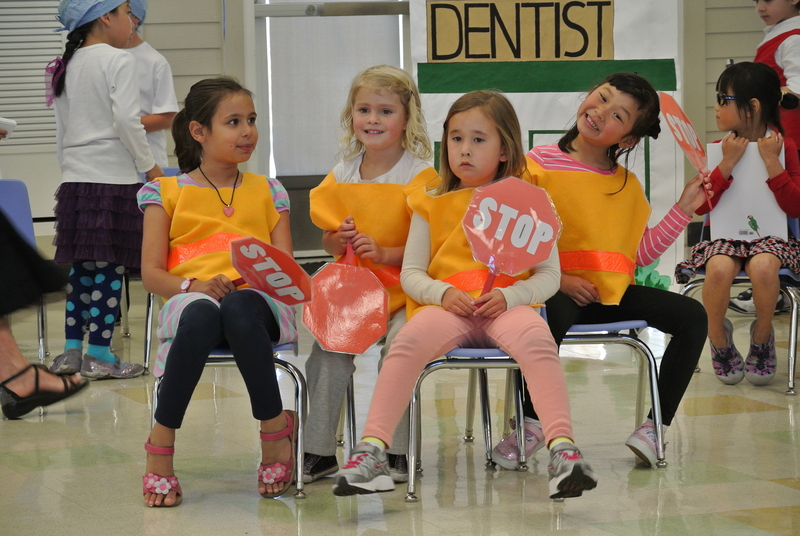 The theme of this play was to tell, in singing form, all the good deeds of our “friendly neighborhood” which included crossing guards, dentists, librarians, firefighters, plumbers, vets, and more. 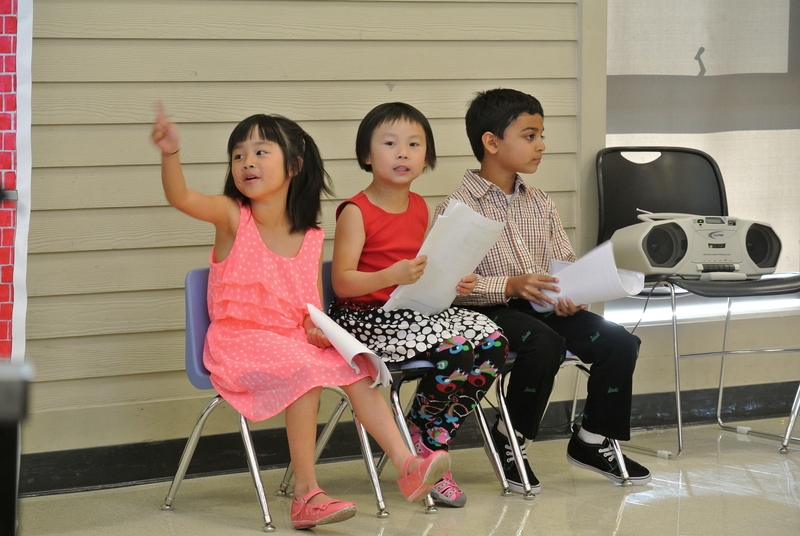 Each student was assigned a role by the teacher, and all the kindergarten classes have been very diligent in practicing and rehearsing for the past month. Brianne, being one of the more advanced readers in the class, was assigned to the storyteller role (aka “Announcer”) and she had quite a few lines to read as each group gets introduced. 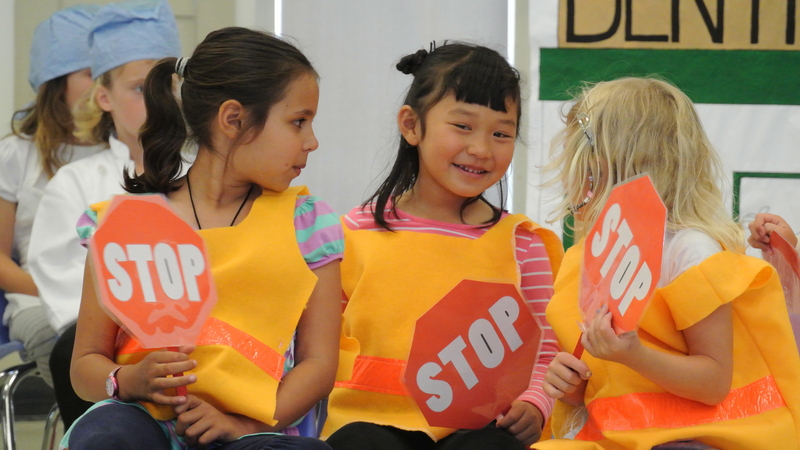 Bridgette was one of the 4 crossing guards, and also had a couple of lines to read. Hearing them practice at home had made us anticipate this play for the entire month, and we were so proud of all the kindergarteners for pulling it off so well! Kudos to the teachers too!